The Neuropsychoanalysis Association invites you to join its exciting new learning platform. NPSA Learning is an innovative web-based portal to study the mind and brain. This online curriculum provides a window into a world of clinical insights and research findings, offering a forum for leading researchers and clinicians from both psychodynamic and biological perspectives. Navigate a new series of easily accessible video-based courses by a range of well-known authorities, from disciplines including neuropsychology, neurology, psychiatry, clinical psychology, and psychoanalysis. Each course is comprised of chapters, with assessments at the end of each in order to test one’s knowledge. 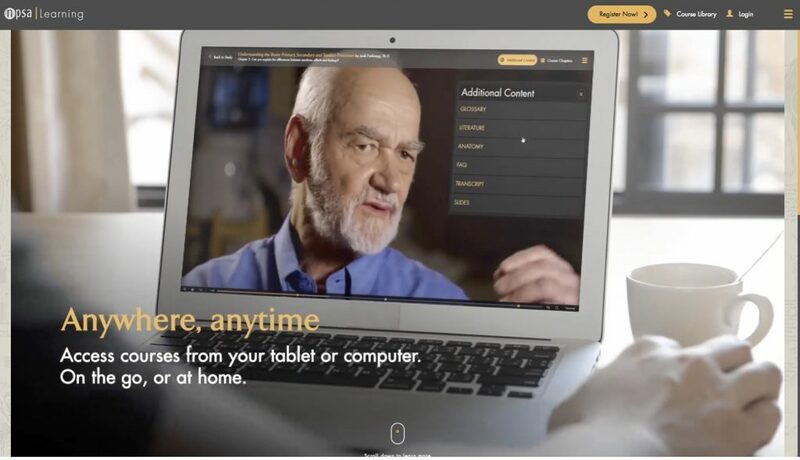 Explore additional content, including scientific and scholarly literature, glossary definitions, transcript functionality, and images and slides to illustrate concepts visually – all making the courses accessible to a wide audience. The easy-to-use platform allows you to navigate between course chapters to immediately find content of interest. New courses will be added to the platform on a regular basis. As part of the NPSA Learning experience you will also have your own personalized “My Study” account page that will direct you immediately to the place where you previously left off. Track your progress, and see your current and completed courses, as well as courses yet to be explored. NPSA Learning is open to professionals and academics who seek to further their career development, as well as any individual looking to enrich their understanding of the fascinating organ called the brain and the brain-mind connection. It was developed with the belief that bringing a rigorous understanding of subjective experience into contemporary neuroscience is fundamental for gaining a holistic account of the workings of the brain.